Take 1 heaping scoop upon awakening. Do not consume more than 1 scoop in a 24 hour period. This product is intended to be consumed by healthy adults 18 years of age or older. This product should only be used under medical or dietetic supervision. This product is not intended as a sole source of nutrition and should be consumed in conjunction with an appropriate physical training or exercise program. This product is not suitable for children under 18 years of age or pregnant or nursing women. Do not take this product with any form of caffeine such as (tea, coffee, soda, etc). KEEP OUT OF REACH OF CHILDREN. How should people take Betaine Anhydrous? Take 1 scoop upon awakening. Do not exceed more than 1 scoop in a 24 hour period. Should people take Betaine Anhydrous with food? Betaine Anhydrous is best taken with food but can be taken on an empty stomach if desired. 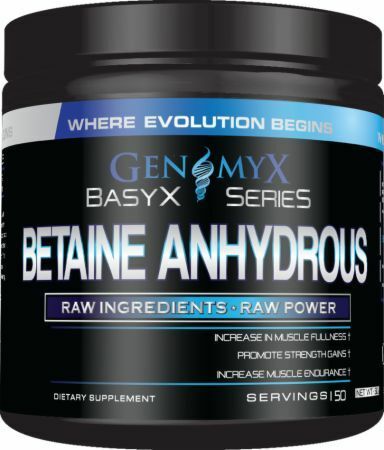 Can I take Betaine Anhydrous with other Genomyx products? Yes, Betaine Anhydrous can be taken with most Genomyx logod products. 60 Grams This is a Buy 1 Get 1 FREE offer!